Van Helsing: The greatest monster hunter of them all has his work cut out for him as he tracks down three deadly foes in this action-adventure saga. Gabriel Van Helsing (Hugh Jackman) is a man who has dedicated his life to battling evil forces who exist outside the bounds of nature; Van Helsing's work has not always made him friends, and a false accusation of murder still trails him. But when he's summoned to Transylvania at the behest of Anna Valerious (Kate Beckinsale), whose family has been fighting supernatural beings for generations, Van Helsing wastes no time answering her call. There, Van Helsing discovers that the undying vampire Count Dracula (Richard Roxburgh) has put a misshapen creature named Igor (Kevin J. O'Connor) under his spell, and, in turn, has forged an alliance with a hideous monster (Shuler Hensley) who was created by the misguided Dr. Victor Frankenstein (Samuel West). Adding to Anna's burden is her brother, Velkan (Will Kemp), a lycanthrope who becomes a bloodthirsty wolf under the light of the full moon. Van Helsing also co-stars Elena Anaya, Silvia Colloca, and Josie Maran as Dracula's vampire brides. Van Helsing Movie Prop Peplicas, Figures, Toys and Collectibles! Deep in the mountains of Carpathia lies the mysterious and mythic land of Transylvania, a world where evil is ever-present, where danger rises as the sun sets, and where the monsters that inhabit man's deepes nightmares take form. Filmmaker Stephen Sommers (The Mummy, The Mummy Returns) brings Van Helsing the legendary monster hunter to film. Van Helsing is masterfully portrayed by Hugh Jackman. 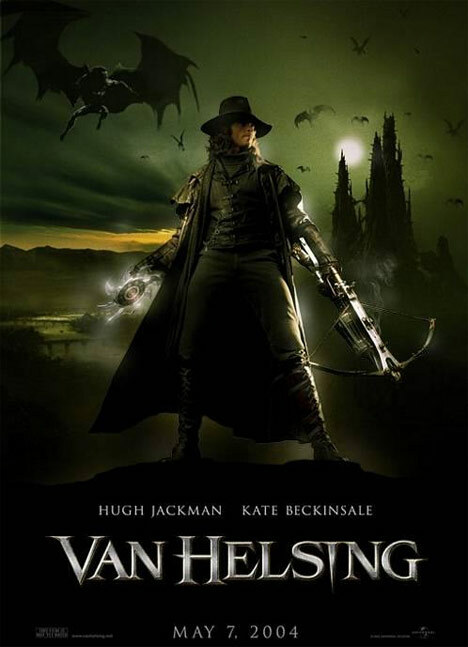 In his ongoing battle to rid the world of its fiendish creatures, Van Helsing joins forces with the fearless Anna Valerious who is played by the breathtaking Kate Beckinsale. 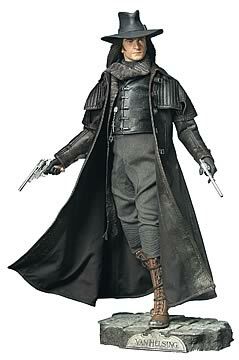 Standing roughly 18-inches tall, this 1:4 Scale Van Helsing figure features film-accurate costuming, a highly detailed Hugh Jackman portrait and posable arms. 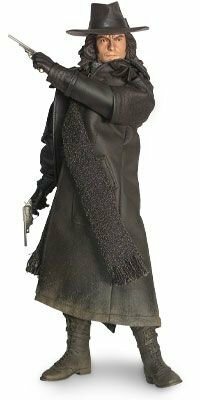 The hands, guns and boots are semi-poseable detailed polystone sculptures and the coat has a wire insert to maintain its shape. 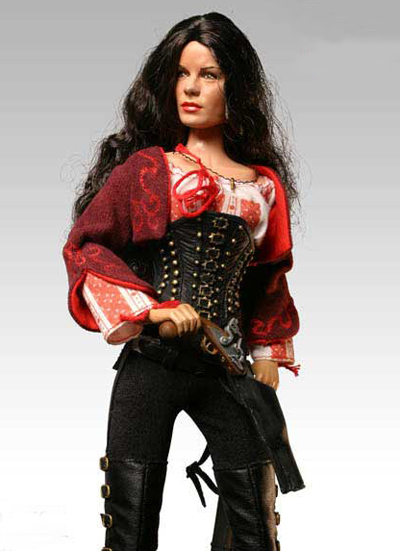 Van Helsing: Anna Valerious 12-inch Figure: This 12-inch Anna Valerious figure features the likeness of Kate Beckinsale and over 30 points of articulation. The figure will include Anna's sword, short sword, sword sheaths, rooted hair, corset and a 12-inch 'Van Helsing' themed display stand. The triple threat of Dracula's Brides from 'Van Helsing' are expertly captured in this dynamic bust. The Brides (played in the movie by Elena Anaya, Silvia Colloca, and Josie Maran) have been hand cast in heavy weight polystone and hand painted to the highest standards. They sit on a stone-textured base featuring the 'Van Helsing' logo. The Base bottom features the title of the piece, sculptor info and edition size. Limited editon of 2,000 pieces. 7 1/2-inches tall and 7-inches wide. Hugh Jackman as Van Helsing, a legendary hunter of monsters. Kate Beckinsale as Anna Valerious, the last descendant of an ancient Romani family. Richard Roxburgh as Count Vladislaus Dracula, the ruler of Transylvania and Lord of the Vampires. Kevin J. O'Connor as Igor, a former servant of Frankenstein's, now working for Dracula. Will Kemp as Velkan Valerious, Anna's brother, who is turned into a werewolf. Silvia Colloca as Verona, Dracula's consort and the leader of the Brides. Josie Maran as Marishka, Dracula's concubine. Elena Anaya as Aleera, Dracula's youngest and most sadistic concubine. Tom Fisher as Top Hat, a Transylvanian grave digger. Alun Armstrong as Cardinal Jinette, Van Helsing's superior in the Holy Order.